Laser Comb, Cloning to Re-grow Hair? 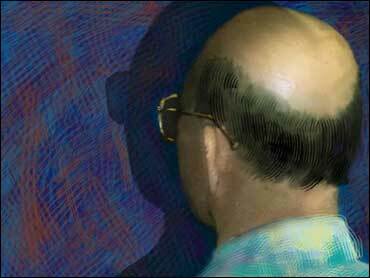 Male pattern baldness affects nearly 70 percent of men by age 35, and 85 percent by age 50! And it's not just men who have to worry: Many women experience thinning hair, too. But there are methods meant to stop hair loss and even induce re-growth - old ones are evolving and new ones continue to pop up. Hair restoration specialist Dr. Alan Bauman of Palm Beach, Fla., discussed the latest techniques, and some that've been around awhile, on "The Early Show Saturday" edition's special broadcast, "New Year, New You." What are the main causes of baldness with men and woman? Hair loss can be influenced by medications, illness, nutrition, stress, smoking, etc. but the most common cause of hair loss is HEREDITY. What about stress? A bout of severe stress can shut down follicles and create a shedding problem that lasts for months. Long-term stress can accelerate hereditary hair loss. Low-level laser therapy (LLLT) can be quite effective when used properly. LLLT is certainly no miracle cure for hair loss. But the laser comb has been OK'd by the Food and Drug Administration for both safety AND effectiveness. It is cleared for hair growth and the treatment of hair loss. Like other non-invasive treatments, some patients get better results than others, and compliance (with directions) is certainly a big issue. However, there are patients who seem to be exceptional responders to this therapy. LLLT is a non-chemical, non-invasive option to help people grow fuller, thicker, healthier hair. Typically, you will apply laser therapy to the scalp two or three times each week. The length of time varies with each different device. How much will these lasers set you back? Portable lasers range from a few hundred dollars to $2,500 or more, depending on the device and treatment times. Typically, the more expensive devices have more "bells and whistles" and shorter treatment times. What does future hold for this technique? New technology in LLLT will improve the compliance and portability of at-home units. Also, non-invasive, simple hair measuring devices will be appearing in doctors' offices and even in high end hair salons. Will it become a reality in the near future? I'm optimistic, but I'm disappointed by the slow progress in this area of research. If you are waiting around for "hair cloning," that's a huge long-shot bet and each month that goes by, more and more hair loss is happening. How effective is this, really? Rogaine is 80 percent effective in clinical trials, but it is difficult to use, and people rarely use it for more than several weeks on their own. It takes a good six months to see significant results with Minoxidil (Rogaine is the brand name). Tracking and consistency are important. Is it true Rogaine only works on the crown of the head, not the front part? That's a myth! The info on the bottle is based on the FDA-approved labeling derived from the clinical trials. As hair restoration physicians, we know -- if there's a follicle there, Minoxidil can influence it. It can work on the front, but it's less dramatic of an effect because, usually, there's more hair loss there. Women can use it, but they have their own brand - why? Two percent Minoxidil in solution was FDA-approved. When they tested the 5 percent, there was little improvement in women over the 2 percent, so they never got the approval. In real-life clinical practice, we prescribe 5 percent for women regularly, and sometimes even stronger. It may be that if you are not 100 percent compliant (missing a couple of doses here or there), you are better off with a higher percentage. We don't know for sure. This is available generically and in name brand form, for $20-$90 a month depending. What is this and how effective is it? Non-invasive treatments are geared mainly toward keeping the hair you have. Without the "target organ," such as the follicle, these treatments will have little effect. All require long-term commitment. If you stop the treatment, you lose the beneficial effects. It's pretty well known that there are some sexual side effects with this drug. How common are they? Rare and reversible. Clinical trials say less than 2 percent. In real practice, many doctors report less than 3 in 1,000 patients have that experience. Sometimes, changing the timing of the dose helps reduce side effects. Is it true women can't take this pill? Propecia is NOT FDA-approved for women. Propecia is contraindicated in women of childbearing age, because it could potentially block DHT formation in a developing male fetus, causing a birth defect. This has never happened; it is theoretical. Small clinical studies on post-menopausal women were unequivocal but, in clinical practice, some post-menopausal women respond to Propecia. Soon, there will be a genetic test to determine if a woman has the potential to respond to Propecia. It takes six-to-twelve months or longer to see the results of Propecia. What happens if you stop taking it - will all the hair that came from it fall out? If you stop Propecia, any improvement you achieved over the course of a year will then reverse in 12 months. These have been around for awhile. Can they look natural? These are NOT your father's painful "hair plugs"! How drastic is the procedure? New, less invasive procedures, such as FUE/NeoGraft, can transplant individual follicles without the use of a scalpels or stitches and leave no linear scar. Healing is complete within a matter of days, not weeks. There are no stitches to remove and athletic activity can resume in just days. One week of healing/scabbing, six weeks until hair growth starts, half of the result visible in 6 months, full result in 12 months. There is no such thing as a completely scar-free surgery. However, the key is whether the scar is visible to the naked eye. Traditional procedures leave a linear donor scar, but FUE/NeoGraft leaves no linear scar. What happens to your natural hair that keeps falling out around the transplanted hair? This is critical! Ninety percent of hair transplant patients are on a multi-therapy, non-invasive treatment regimen to stop the progression of hair loss. Because hair loss is progressive and the transplanted hair is permanent, if you don't protect the hair you have, you will need more transplantation to fill in the thinning areas than if you were on a preventative treatment regimen. Hair transplant procedures range from $10,000 to $20,000 depending on the type and size of the procedure.